Remember a year ago when there was all that mom is turning 60 hoopla? All the crazy meals? All the shenanigans? All the to-do? Well, it’s a year later, and that time again, but only 61 this time, which basically means nothing. Well, nothing other than I took my mom out for a birthday dinner. And without fail, what does she pick? Sushi. That’s what she always picks. Seriously, she’s a creature of habit. The place is small and next to the vet. That’s just how I’ve always known it. Oh, Ginza, next to the vet, right? You get complimentary edamame. I love anything complimentary. 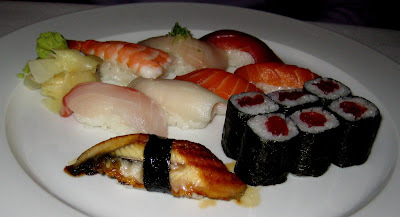 Moms went with sushi regular. The food came out nice and quick and everything was fresh. 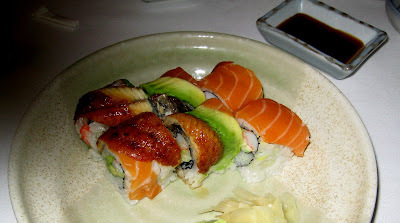 I got a paradise roll, which had crabmeat, avocado, cucumber, eel, and salmon. Quite tasty. 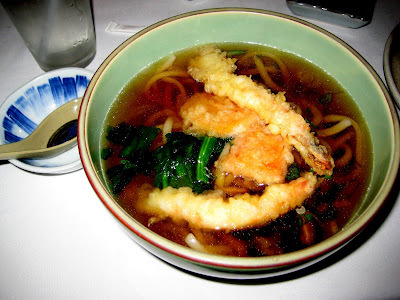 I also got a tempura udon. It was a good sized portion and simple. It wasn’t too salty or too sweet, it was quite plain, but in a a good way. The shrimp tempura were a good size (not too huge) and nicely fried. The service is pretty good. The host (owner, I think) is just about the nicest man ever. Strangely enough, during our visit, there were tons of kids there, and I mean young kids. It was as if it was family night at Ginza. I don’t know about you, but I’d never seen so many kids at a sushi place in my life. On a cute note, there was a little girl you was trying to eat edamame. It was hilarious, ad the slippery little suckers kept flying all over the place! Ginza is not cheap. In fact, it’d been a few years since I’d been, and while the food stayed the same (still good) it really did seem like the prices went up. That was a disappointment, but the food itself was great.